University City is the new home to Microsoft’s latest Reactor center; this makes Philadelphia the third city to welcome Microsoft’s base for collaboration, now joining both New York and San Francisco. As part of the University City Science Center, the Reactor is essentially a science resource center for all things tech and beyond. Best of all, we’re giving you a chance to experience the new facility free of charge. Here at Tech Impact, we are excited to announce our upcoming event in collaboration with Microsoft Philanthropies and the Microsoft Citizenship team. 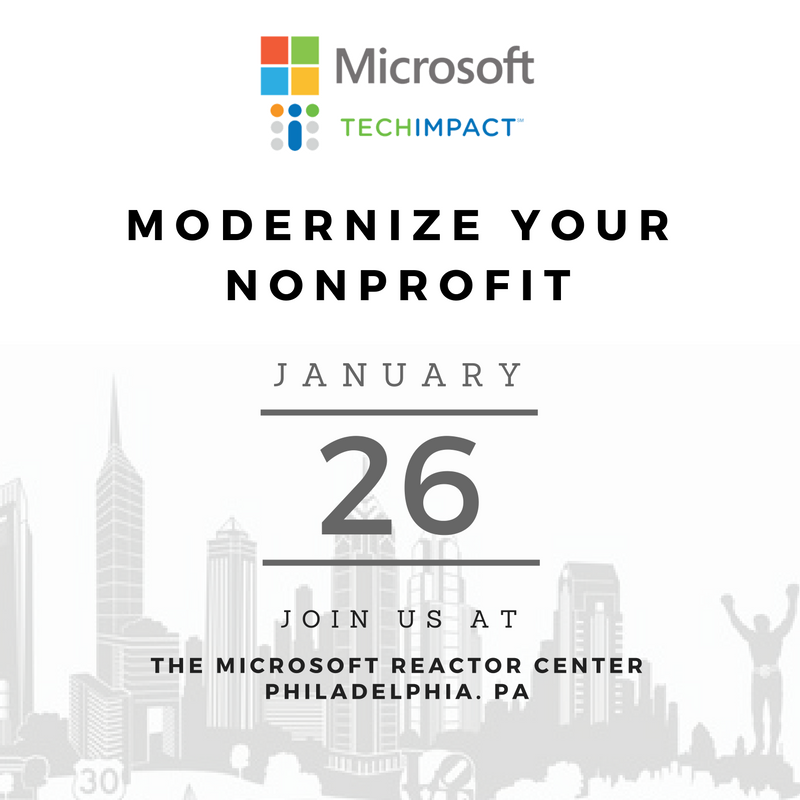 Join us at the Microsoft Reactor center for a morning of interactive training for nonprofit leaders and IT decision makers. Learn about the Microsoft cloud and how it can help cut technology costs, increase workplace collaboration, and transition you towards a more modernized way of running your nonprofit. This is your chance to seize the $5000 yearly Azure credit, which is a part of the Microsoft Cloud Nonprofits Donation. Through Microsoft Philanthropies, nonprofits are given the opportunity to take advantage of discounted or even free Office 365 licensing depending on your needs, nonprofit size, and technology budget. Learn more about these offers during our session on January 26th. If you feel that you could benefit from a new system that allows you to share your impact and better understand your nonprofit’s potential areas of improvement, then this event is beneficial for you. Many nonprofits have staff that work from all over the world; if you are looking for a way to have more mobile and flexible options for your nonprofit, then the cloud can help. For those who handle secure and sensitive information, Microsoft has you covered. Beyond being affordable to nonprofits, the cloud is an overall step-up from normal servers. Accessible from anywhere, the cloud allows for more flexible accessibility and encourages better communication between your staff. In a time of modern technology and ever-changing business standards, you will not get left behind with the cloud. It’s time to modernize your nonprofit, and ensure that your impact is as strong and wide-spread as possible. Not a Philadelphian? That's okay - we're also coming to these cities in 2017: Hartford, New York, Charlotte, Atlanta, San Francisco, Denver, Chicago, Dallas, and Detroit! You can also always access our Office 365 resources online. Enjoy a free breakfast and all-things-tech discussion with Microsoft and our team at Tech Impact. What better time to begin a new plan for your nonprofit than the new year?